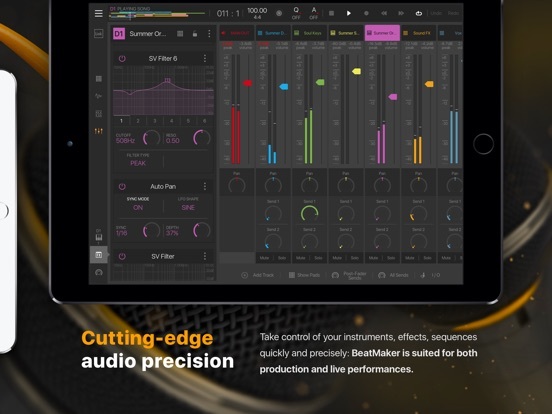 Its streamlined workflow lets you perform and shape your ideas quickly and effectively, turning your instruments into full productions. Inspirational performance tools such as repeat, roll, swing, key scales & chords and macro controls will boost your creativity tenfold. Take control of it all with your MIDI gear and the new smart binding system. 8 banks of 128 pads, where each one of them is a full-fledged instrument with multiple dimensions. Record and chop live, assemble, mangle and resample: our state of the art sampling engine will sculpt your ideas, giving life to your instruments with a full modulation and layering system. With ZPlane’s Elastique live stretch and pitch shift, adjust your loops and instruments to match the tempo or go experimental. 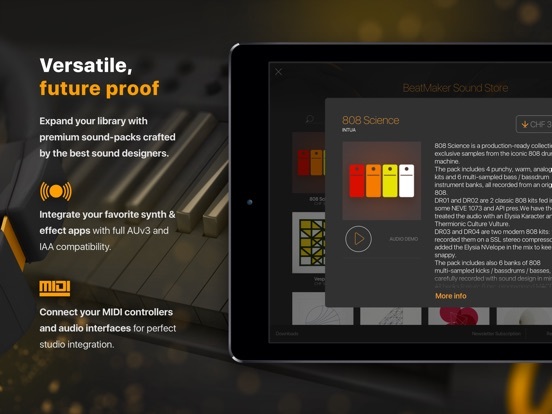 You can even integrate your favorite synth & effect apps with full AUv3 and IAA support. The classic timeline based pattern & song editor gives all the modern sequencing features you‘d want to arrange complete tracks. 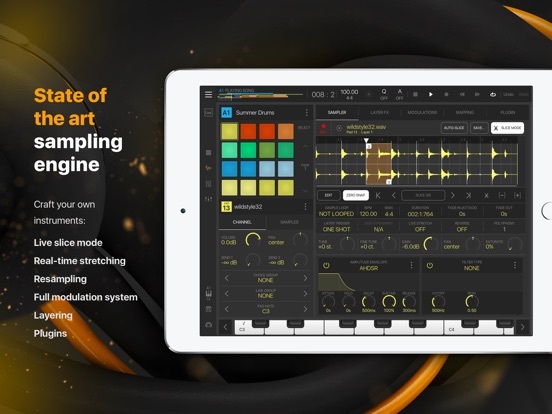 Adding to this foundation, the new flexible Scene Mode opens up opportunities for remixing and live performances, looping and arranging clips in new ways. All the patterns, automations and sequencing tools are available right where you would expect. 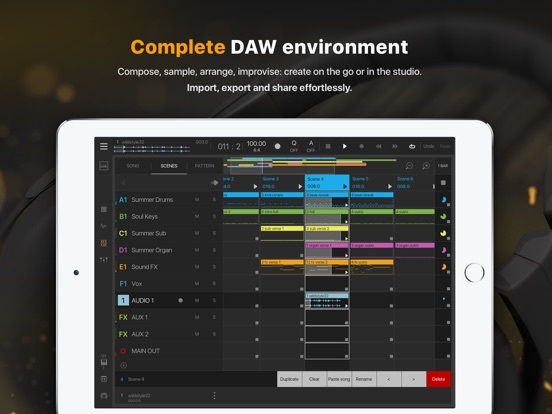 Add audio tracks to the mix, stretch them, turn your arrangements into a complete masterpiece. You can even play in sync with other software using Ableton Link. Multi-channel recording & input/output routing is now a reality with the support of USB audio interfaces. Fine-tune your mix with the modern mixing board: every track, every pad has its own channel with unlimited effects and up to 8 sends. Add new depths to your sound with our palette of effects (internal or external AUv3/IAA). Read the full specs on http://intua.net ! 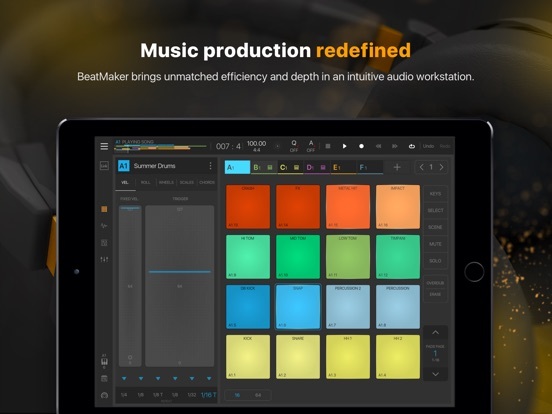 – Works with 32-bits and 64-bits iPads.